남산골한옥마을 전시프로젝트 “예술, 한옥을 품다”는 두 번째 전시로 을 기획한다. 엉뚱한 상상에서 허황된 욕심까지 꿈이 펼치는 이미지는 무궁무진하다. 작가들의 재기발랄한 상상력과 날카로운 현실 인식 사이에서 탄생한 작품들이 한옥과 만나 새로운 이야기를 건넨다. 그 속에서 어린 시절 잊고 지낸 꿈을 보물찾기처럼 느닷없이 만날지도 모를 일이다. A wild and exciting dream A gust of dreams for finite lives Walk around the Hanok village dreaming on the wing of the crispy autumn wind. 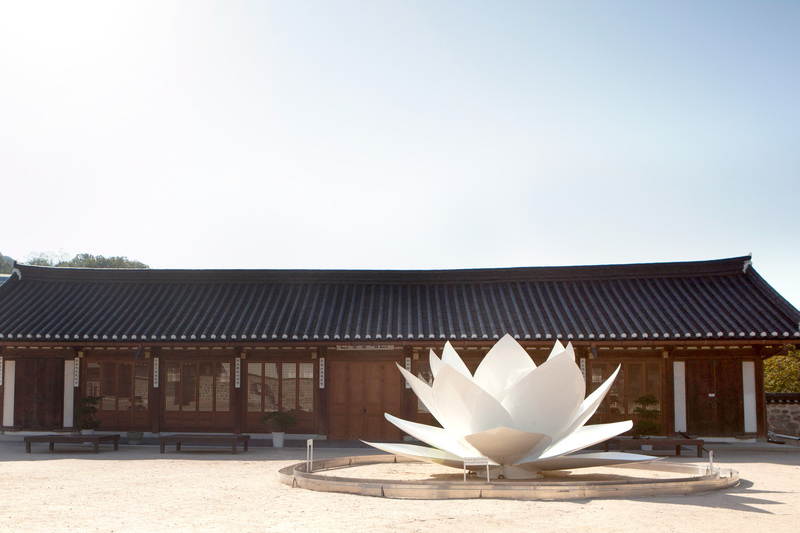 Namsangol Hanok Village presents as the second exhibition for “Hanok Embraced in Art” project. From wild imaginations to lavish desires, dreams can incubate infinite stories. In this exhibition, the dreams are unfurled as new stories in Hanok, where the artists’ witty imaginations meet their sharp grasp of reality. You might encounter the treasures you lost in your childhood among the many dreams we bring to you. 한옥마을 입구 우측에 서울시공영주차장이 있으나, 매우 협소합니다. 도착 전에 확인하시기 바랍니다. 눈과 마음으로 전시를 즐겨주세요. 한옥마을에 전시된 작품은 작가가 한땀 한땀 정성들여 설치한 작품입니다. 온전한 작품으로 모든 사람들이 평화롭게 관람하실 수 있도록 눈으로만 감상하시는 센스를 보여주세요. Touch with eyes, not with your hands. 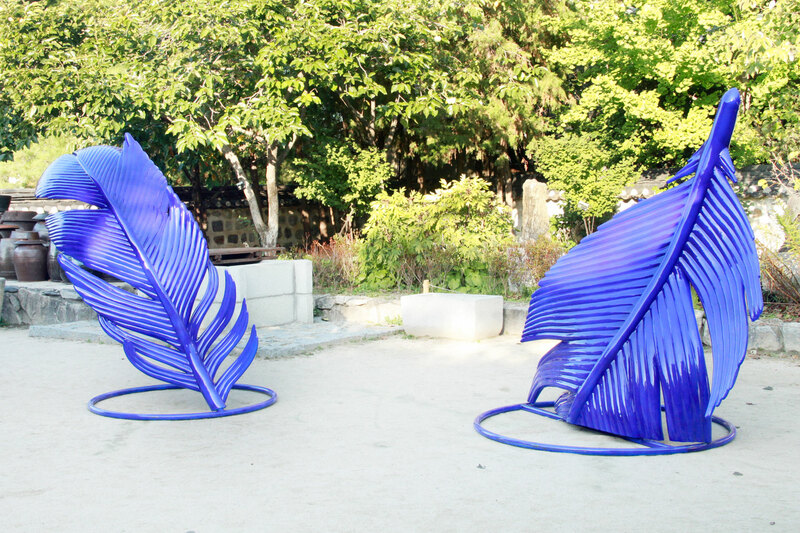 The works of art in Hanok village are delicately installed by the artists. Please enjoy the artworks only with eyes and help us maintain the optimal quality of the artworks for everyone. 연꽃은 우리나라 문화뿐만 아니라 고대 그리스, 이집트, 수메르 등의 전 고대 문화권에서 우주 창조, 태양의 상징으로 과거, 현재, 미래 통합의 상징성으로 가장 추앙받던 사유세계 계념을 가진 꽃이다. 후에 불교 문화권에서 발전시켰다고 할 수 있으나 불교의 특정된 곷은 아니라고 할 수 있다. 이것은 세계 곳곳의 유적지에서의 연꽃 형상을 통해 고대 문화권에게 영향을 미친 꼿이라는 것을 잘 말해주고 있다. 작가는 한국문화의 한 형태로서 종교차원을 넘어선 ‘범문화적 의식’으로서 "백련"을 서울 도심의 남산골한옥마을에 설치하여, 현대인들이 바쁜 일상 속에서 잠시나마 자신의 잃어버린 정체성을 찾아가는 겸허한 시간을 갖도록 하게한다. Lotus has been considered as the symbol for the sun, the creation of the universe, and the possible integration of the past, present and the future in not only traditional Korean culture but also in other ancient cultures such as Greek, Egyptian, and Sumerian cultures. The lotus and what it represents can easily be associated with the Buddhist culture, but by all means the lotus is not limited to Buddhism. The existence of lotus shapes in various historic sites in the world verifies that the lotus influenced many ancient cultures. With the artwork, Kim elevates a piece of Korean culture to a piece of pan-cultural visual artwork, beyond and above any religious references. ‘하늘을 나는 물고기’는 일탈을 꿈꾸는 현대인을 상징한다. 현대인들이 매일 반복되는 답답한 일상을 벗어나 미지의 ‘그 무엇’을 꿈꾸듯이 물고기들도 가끔 하늘을 나는 꿈을 꿀 수 있다. 꿈꾸는 자유는 때로는 날게 할 수 있다. 물고기들조차. Contemporary humans often dream of deviating from their daily routine. The ‘fish flying through the sky’ we made symbolizes contemporary men dreaming of such deviation. Even fishes can fly in freedom to dream. 찬란한 청춘의 나무는 검게 사그라져간다. 우리가 기억하지 못하는 그 날들을 기억하려 한다. the green and glamour of trees fades to black. all those small but blazing memories! 는 르네 마그리트의 회화 과 ‘이상한 나라의 앨리스’에서 앨리스의 몸이 커지면서 방에서 옴짝달싹 못하던 장면에서 아이디어가 비롯되었다. 사과는 역사, 동화, 예술, 종교 등에 많이 등장하는 소재인데, 박성연의 작품 는 고정되어 있지 않고 부풀어졌다 작아졌다 반복하며 마치 사람이 숨을 쉬듯 반복한다. 작가는 우리가 고정되어 있다고 생각하는 사물들을 움직이게 하고 현실 상황에 빗대어 은유적으로 표현하였다. 우리는 누군가의 자식, 학생 직장인 등과 같은 역할을 하고 있다. 작품 는 옥탑방의 라푼젤이나 몸이 커져 방에 갇혀버린 앨리스 그리고 현대사회의 시스템 안에 있는 ‘나’를 사과에 빗대어 표현한 작품이다. derived from by Rene Magritte and the scene in Alice in Wonderland in which Alice swells up and gets stuck in the rabbit’s house. Often used as a popular subject matter in history, fairytales, art and religions, the apple in repeatedly inflates and deflates, mimicking human breathing patterns. Park draws the metaphor to the real world by breathing life into objects that are commonly perceived as inactive. 집은 사람이 살면서 생활하는 꼭 필요한 공간이며, 현대인들의 소유에 대한 욕심과 갈망의 상징이기도 하고, 동시에 삶과 죽음을 이어나가는 역사적인 공간이기도 하다. 이번전시는 한옥이라는 전통적인 건축안에 땅을 재는 단위인 :평(坪)으로 한평의 집을 붉은 실로 지었다. 붉은 실은 사람들 사이의 관계, 사람과 물건, 사람과 영혼 등 사람들이 살아가면서 만나게 되는 많은 보이지 않는 관계들을 표현한다. A house is a needed space for people to live and also a representation of greed and desire for the possession of the people in this generation. At the same time, it is also a historical living space between life and death. 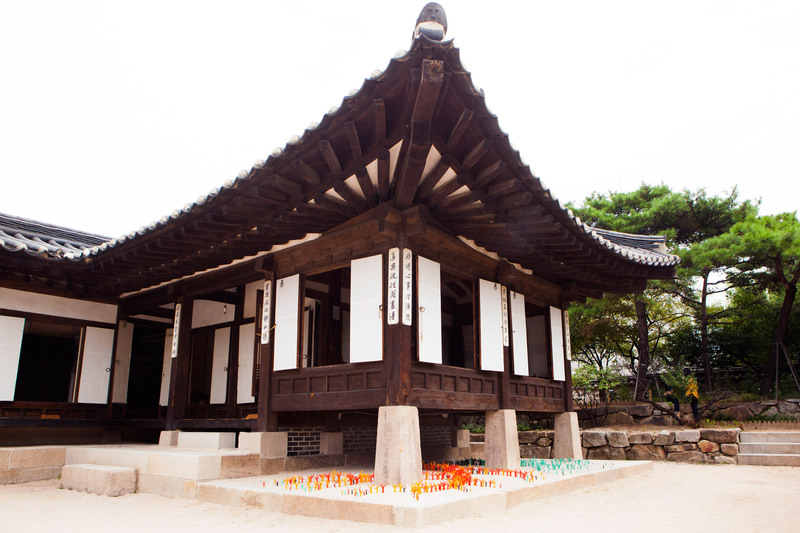 This exhibition held in the Korean traditional building called hanok. ‘The house of one peng’ (unit of building and land) built of red threads. 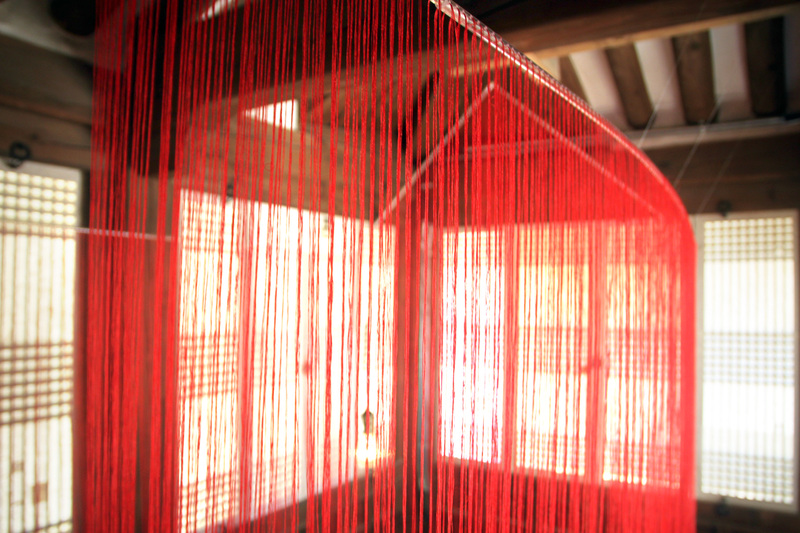 The red threads represents the invisible relationship between people and people, people and objects even life and death. 푸른색으로 공간을 점유하는 형식의 설치작업은 단일색으로 인해 기존의 공간이 다른 공간인 것처럼 환상의 공간이 되어 관객이 바라보고 둘러보는 형태의 참여를 이끌어낸다. 푸른색의 공간은 작가의 내면의 공간을 재현한 것으로 지금 존재하는 것이 아니기 때문에 판타지를 갖게 되는 것이며 현재의 공간을 기억속의 과거의 공간으로 돌려놓는 환상과도 같은 것이다. 깃털(The feather)은 가볍고 가늘고 약한 이미지를 가지고 있지만 그 자체로 복된 긍정의 상징이며, 인간이 뻗지 못하는 영역까지 넘나들 수 있는 신비로운 힘을 가진 개체이다. 그래서 이번 전시는 형태와 사이즈가 변이된 신비로운 깃털에 작가의 블루를 입혀 공간과 시간을 초월할 수 있을 것 같은 푸른 깃털-the feather를 의도하였다. 작가 개인의 감정을 소통하고 발산시켜주는 매개체인 푸른 깃털은 내면의 은밀한 공간을 현재의 이 시간, 공간으로 끄집어내어 의미 확장과 새로운 형태의 현재의 공간으로 전환되게 유도한다. 이것은 개인적인 내면을 얘기하는 것에서 적극적으로 새로운 환경과 소통하고 관객과 대화하는 형식으로 확장되는 것이다. 크기가 변이되거나 여러개의 푸른 깃털은 과거와 현재 그리고 내면과 지금 여기의 공간을 연결하는 역할을 할 것이며 전시공간은 하나로 결합되어 기존의 공간과는 다른 비일상적이고 낯선 장면으로 다가올 것이다. 오랜 시간을 머금고 있는 한옥마을에서의 깃털로 인해 한옥 특유의 환경과 푸른 깃털로 인해 그곳은 기존의 전통 가옥이 아닌 낯선 장면을 나타낼 것이며 관객들은 일시적인 긴장감을 느낄 수 있으며 오감을 통해 판타지를 가질 수 있다. A space possessed in blue transforms the everyday space into an illusionary and unique space with the power of mono-color and can elicit active visual participation. By substantializing the imaginative space residing in the artist’s memory, the blue space carries illusory quality that brings back the space of the past to the space of the present. The feather is known to embody a light, slender and delicate image but in fact it also represents the blissful spirituality that can mysteriously cross over to the domains where humans cannot reach. With the spiritual power of the feathers in mind, the artwork presents blue feathers—mysterious feathers in various sizes and shapes colored in blue—for they can transcend time and space. As the medium to communicate Cho’s inner thoughts and emotions, the blue feathers bring out and materialize the artist’s private inner space to the space where the audience presently stand. As the blue feathers facilitate the transition of spaces, they also enable further expansion of meanings. From the passive narration of the artist’s inner thoughts and emotions to the active communication with the audience in a new environment, the artwork expands its domain. The blue feathers serve to bridge the past to the present, and the inner world to the physical world by bringing two spaces into coexistence which changes the nature of the exhibition area to an unusual and unfamiliar sight from an ordinary and familiar one. 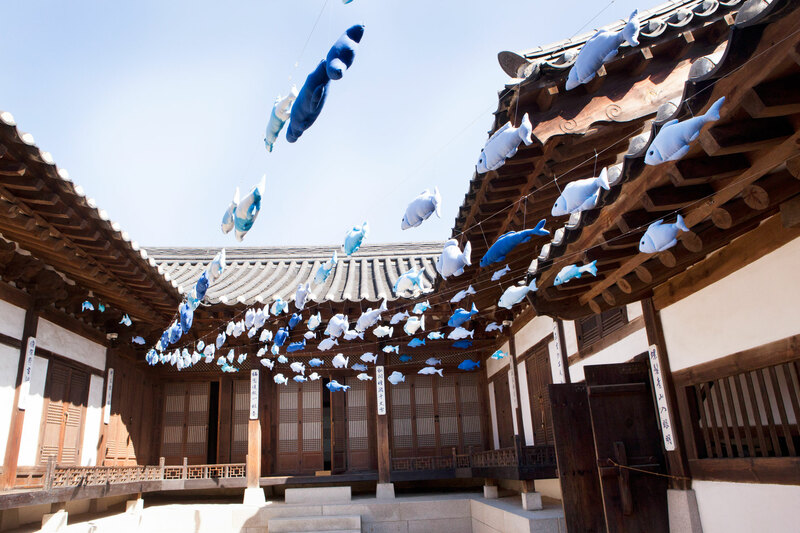 In Hanok village where a long-standing history breathes, the blue feathers will add a layer of unfamiliarity to the usual and immerse the audience in refreshing illusory tension. 남산골한옥마을 전시프로젝트 “예술, 한옥을 품다”는 두 번째 전시로 을 기획한다. 엉뚱한 상상에서 허황된 욕심까지 꿈이 펼치는 이미지는 무궁무진하다. 작가들의 재기발랄한 상상력과 날카로운 현실 인식 사이에서 탄생한 작품들이 한옥과 만나 새로운 이야기를 건넨다. 그 속에서 어린 시절 잊고 지낸 꿈을 보물찾기처럼 느닷없이 만날지도 모를 일이다. 준비 중입니다. 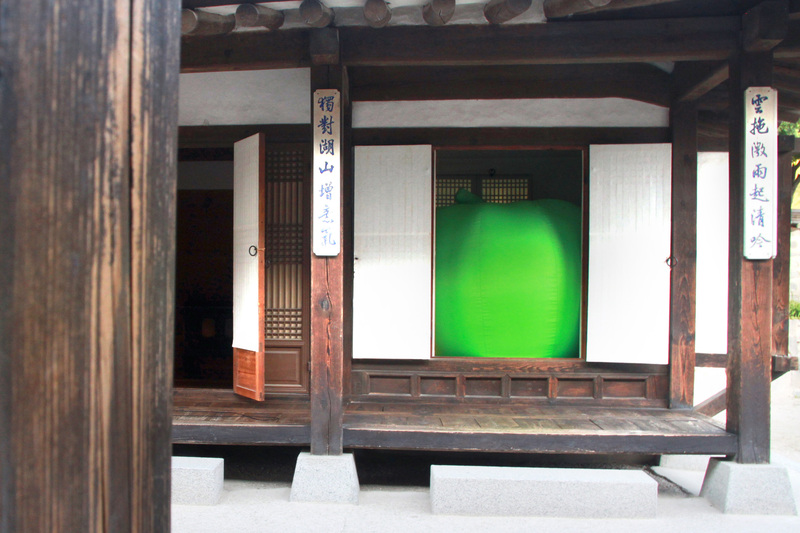 Namsan Hanok Village exhibition project "Art, incubate Hanok" is planning Second Exhibition. The images unfold in the wrong dream to imagine absurd greed is endless. Works born from the imagination of artists between witty and sharp recognize the reality that geonnenda Hanok met with a new story. Childhood is one idea out of the blue like a forgotten treasure hunt map to meet the former dream in it. Work in Pregress.